Hospitals in Sub-Saharan Africa (SSA) face major workforce challenges while having to deal with extraordinary high burdens of disease. The effectiveness of human resource management (HRM) is therefore of particular interest for these SSA hospitals. While, in general, the relationship between HRM and hospital performance is extensively investigated, most of the underlying empirical evidence is from western countries and may have limited validity in SSA. Evidence on this relationship for SSA hospitals is scarce and scattered. We present a systematic review of empirical studies investigating the relationship between HRM and performance in SSA hospitals. Following the PRISMA protocol, searching in seven databases (i.e., Embase, MEDLINE, Web of Science, Cochrane, PubMed, CINAHL, Google Scholar) yielded 2252 hits and a total of 111 included studies that represent 19 out of 48 SSA countries. From a HRM perspective, most studies researched HRM bundles that combined practices from motivation-enhancing, skills-enhancing, and empowerment-enhancing domains. Motivation-enhancing practices were most frequently researched, followed by skills-enhancing practices and empowerment-enhancing practices. Few studies focused on single HRM practices (instead of bundles). Training and education were the most researched single practices, followed by task shifting. From a performance perspective, our review reveals that employee outcomes and organizational outcomes are frequently researched, whereas team outcomes and patient outcomes are significantly less researched. Most studies report HRM interventions to have positively impacted performance in one way or another. As researchers have studied a wide variety of (bundled) interventions and outcomes, our analysis does not allow to present a structured set of effective one-to-one relationships between specific HRM interventions and performance measures. Instead, we find that specific outcome improvements can be accomplished by different HRM interventions and conversely that similar HRM interventions are reported to affect different outcome measures. In view of the high burden of disease, our review identified remarkable little evidence on the relationship between HRM and patient outcomes. Moreover, the presented evidence often fails to provide contextual characteristics which are likely to induce variety in the performance effects of HRM interventions. Coordinated research efforts to advance the evidence base are called for. While Sub-Saharan Africa (SSA) is home to 12% of the global population , it employs 3.5% of the global health workforce to service a disproportionate 27% of the global burden of disease . A majority of countries across the globe for which the health workforce shortage is classified as critical (36 out of 57) lie in SSA [3, 4]. Most SSA countries are not able to attain an average health workforce density of 2.5 per 1000 population as recommended by the World Health Organization (WHO) [5, 6] and half of the SSA countries have fewer than ten physicians per 100,000 people (while Western countries commonly have 250 per 100,000 or more) [5, 7–9]. The low workforce density and high workload in SSA especially impacts hospital [6, 7]. The shortage of supply to match demand further increases because of low retention rates among skilled health workers [8–12]. Implementation of human resource management (HRM) practices is needed to improve the situation for a depleted and overstretched health workforce, and patient outcomes [10, 13–18]. Research on HRM interventions in SSA hospitals have so far primarily addressed (human) resource availability, e.g., “head counts,” technical skills, and basic working conditions [19–28]. These practices are often referred to as “hard” HRM . Hard HRM refers to approaching employees as one of several categories of organization resources (e.g., financial resources, equipment) that influence organizational effectiveness and are mostly organization-centered and reactive [26, 29, 30]. Although hard HRM practices have shown to be related to improved performance outcomes (e.g., waiting time, quality of care, patient experiences) [18, 31, 32], broader HRM interventions are needed to sustain hospital service quality and retain a satisfied workforce [10, 24]. Soft HRM practices are more employee-centered and focused on work-environment. They single out human resources as most important and subsequently address training and development needs, tasks and roles, communication, delegation, and motivation [29, 33, 34]. In the last decade, especially soft HRM practices have shown to impact performance, sometimes in combination with hard HRM practices [25, 33, 35]. However, understanding and the adoption of soft HRM practices in SSA hospitals is limited [18, 36–38]. The growing evidence of the relationship between HRM practices and performance has shown to be complex and is frequently referred to as “black box” [39–42]. Dieleman et al. underline the importance of context when stating that a HRM practice may result in different outcomes when applied in different contexts, as contextual factors are likely to influence outcomes . The current evidence base on effectiveness of HRM practices is mainly developed in particular research settings, namely hospitals in the USA and Western Europe. Next to the high variation within these settings (e.g., type of hospital, financial management, government), there are major differences compared to the SSA setting (e.g., low providers capacity, low economic status, challenging socio-cultural issues, demographic trends, high disease burden). It is therefore likely to have limited validity in SSA . A first relevant and major contextual difference is formed by the combination of a disproportionally high burden of disease and health workforce shortages occurring in SSA contexts, which so explicitly outline the societal relevance of understanding the relationship between HRM practices and performance [43–46]. In addition, major cultural differences exist, as well as differences in public service infrastructures and operations , financial resource limitations, availability and quality of medicines, materials and equipment, disease prevalence, and health literacy [10, 34, 37, 47–52]. Rowe et al. highlighted the need to generate knowledge about the strategies to improve performance by HRM practices in low-resource settings and called for dedicated and updated systematic reviews . Harries and Salaniponi underlined this by stating that “getting the most out of the already depleted and overstretched health workforce in resource-poor areas is a priority” . This study presents a systematic literature review on the relationship between HRM and performance for SSA hospitals. 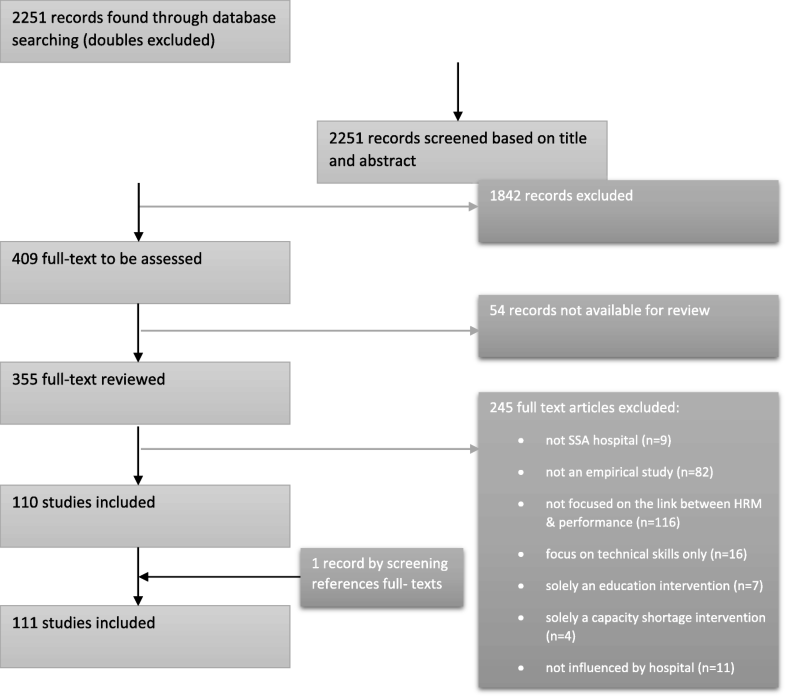 We conducted this systematic literature review following the Preferred Reporting Items for Systematic Reviews and Meta-Analyses (PRISMA) [53–55]. The geographical SSA setting as defined by United Nations . For example, terms regarding SSA or the SSA countries separately (e.g., Benin, Ethiopia, Kenya, South Africa). Healthcare setting and healthcare workforce. For example, hospitals or physician. Terminologies related to HRM practices. For example, human resource management, training, skills, motivation, competences, or compensation. Additional file 1 provides search term details. The search strategy was conducted in collaboration with a librarian from a medical library specialized in designing systematic reviews in April 2016. The search strategy resulted in 2251 titles/abstracts (doubles excluded) (see Table 1). Studies were included if they met the following inclusion criteria: (1) Empirical study, regardless of the research methods; (2) focusing on links between HRM and performance outcomes; (3) SSA region; (4) hospital setting; (5) English language; and (6) published in a peer reviewed scientific journal. Studies were excluded based on the following exclusion criteria: (1) focus on technical skills only (e.g., clinical skills training) as opposed to non-technical skills (e.g., team work training, personal communication training) [57, 58]; (2) HRM interventions which were not under the control of hospital management but enforced by the Ministry of Health or external partner organizations such as the WHO (e.g., a national HIV educational intervention); and (3) studies that solely address capacity shortage (e.g., employing additional nurses). Studies which solely report on reducing capacity shortages are excluded as they are expected to improve effectiveness by definition. We followed a four-stage selection process using a structured Excel format : screening the title and abstract on the in- and exclusion criteria. This was performed independently by two authors. In case of disagreement between the two authors, the third author decided or postponed the decision to the next stage. The first stage reduced the initial search of 2251 hits to 409 hits. Examining the full text on the in- and exclusion criteria. The second stage was also performed by two authors. In case of disagreement, the third author was included to make the final decision. The second stage reduced the publications to 110 articles. Summarizing all accepted full articles by the first author. Reference and biography check of the summarized articles resulted in including one additional article and hence a total of 111 included articles (see Fig. 1). Managing employees (through leadership support and mentoring). All labeled practices from the data collection process on single HRM practices were categorized accordingly. Additional file 2 presents the number of studies that link a specific HRM practice to a specific outcome. Studies presenting research on HRM bundles, i.e., interventions which combine multiple practices, are classified following Subramony (, p. 746-747]) (see Table 2). The five categories of single HRM practices can be placed under the classification of Subramony as follows: empowerment enhancing (task shifting), motivation enhancing (salary and compensation, rostering and scheduling, managing employees), and skills enhancing (training and education). Patient outcomes (patient experience, clinical outcome). We appraised the quality of the studies using the revised version (2011) of the Mixed Methods Appraisal Tool (MMAT) [61–63], as commonly applied in systematic reviews (e.g., [64–67]). For qualitative and quantitative studies, the scores represent the number of criteria met, varying from one criterion met (*) to all criteria met (****). For mixed method studies, the scores represent the lowest score of the quantitative and qualitative components, as the quality of the study cannot surpass the quality of its weakest component. Tables 5 and 6 present the MMAT scores of the included studies. The selected studies represent 19 out of 48 SSA countries (presented in Additional file 3). The six most studied countries are South Africa (32 studies), Tanzania (14), Kenya (13), Nigeria (10), Ethiopia (8), and Uganda (8). Five studies researched hospitals in multiple SSA countries. As a research setting, 16 studies simply mention hospitals without specifying the type of hospital, in contrast to the others that specified whether it regarded public, national, private, missionary, teaching, district, secondary care, rural, and/or primary care hospitals. The research included 36 qualitative (32.4%), 57 quantitative (51.3%), and 18 mixed methods (16.2%) studies. Table 3 displays the MMAT quality scores of the included studies. Table 4 shows that while most studies (n = 85, 76.6%) considered a bundle of HRM interventions (as opposed to a single practice intervention), they typically addressed only one performance outcome (n = 81, 73.0%). For ease of exposition, we now first present a narrative synthesis of the results on single HRM practices and subsequently of the results on HRM bundles. Table 5 (single HRM practices) and Table 6 (HRM bundles) present detailed review findings and the corresponding references. Ten studies presented evidence on the relationship between training and outcomes [75, 94, 100, 102, 148, 150, 155, 146, 166, 172]. Six of these studies considered employee outcomes, two of which found a positive association with job satisfaction and retention [166, 172]. Four other studies (from South Africa, Tanzania, and Nigeria) [94, 102, 146, 148] found negative relationships between training and employee outcomes. Two of these studies also reported improved team performance as a result of team-training, but their evidence was qualified as weak [146, 172]. Three of the four studies focusing on organizational outcomes reported improvements in the quality of care [94, 150, 166]. The two studies reporting on patient outcomes found non-significant reductions in (maternal) mortality rates [155, 172]. Research on salary and compensation almost exclusively regarded individual employee level outcomes (four studies). More specifically, they reported employee performance improvement [69, 83, 120], and one study reported improved employee retention . The four studies on rostering and scheduling each reported different, yet positive, effects on employee outcomes or organizational outcomes [121, 122, 126, 154]. One low-quality study  reported failure of HRM interventions (e.g., staff control strategies and scheduling/rostering) to reduce turnover intention. The six studies that researched task shifting/task delegation reported organizational outcomes. Three of the studies reported improvement in efficiency, while the other three reported to have reduced employee shortages. Interestingly, the evidence reported on the relationship with clinical outcome and quality of care was inconclusive (e.g., [95, 96]). The two studies which involved leadership and mentoring practices both reported improved job satisfaction by employees [158, 160]. Table 6 shows that the majority of the studies that researched HRM bundles have considered bundles that combine practices from multiple HRM themes (i.e., empowerment, motivation, and skill). Motivation-enhancing practices (n = 71, 83.5%) are the most researched in SSA and refer to intrinsic and/or extrinsic motivation-enhancing HRM practices in a bundle. Five studies (6%) considered bundles that only included motivation-enhancing practices [88, 97, 123, 125, 156]. These studies reported improved employee outcomes, such as job satisfaction, performance, retention, and staff motivation. Many studies reported on bundles combining motivation- and skills-enhancing practices (n = 34, 40%). (e.g. [74, 77, 85, 90, 93, 104, 106–108, 113, 118, 130, 131, 138, 139, 142, 143, 149, 153, 157, 159, 165, 174]). These bundles are mainly linked to positive employee outcomes (e.g., improved job satisfaction, retention, and performance) and to a lesser extent to organizational outcomes. Notable is that two studies [112, 141] showed inconclusive relationships with job satisfaction and staff retention. Eleven studies (12.9 %) considered bundles which combined motivation-enhancing and empowerment enhancing HRM practices [70, 78, 99, 105, 110, 115, 117, 127, 136, 140, 163]. These bundles were largely linked to employee outcomes (e.g., improved job satisfaction, motivation) and to a lesser extent to organizational outcomes. Notable, one study reported how a bundle which combined empowerment-enhancing (team work) and motivation-enhancing HRM interventions (flexi-time system, scheduling) failed to reduce staff turnover . Twenty-one studies (24.7%) utilized practices from each of the three categories empowerment-, motivation-, and skills-enhancing HRM practices. The results in these studies again mostly present improved employee outcomes (e.g., task performance, retention, motivation, and satisfaction) and some present improved organizational outcomes (e.g., quality of care and efficiency). The majority of the studies included extrinsic motivation practices, such as salary (n = 40, 47.1%) and supplementary allowances/incentives (n = 27, 31.8%). These financially oriented incentives were most frequently combined with the skills enhancement intervention training (32 studies), and less with empowerment interventions (13 studies). Six studies reported a combination of financial incentives with teamwork [72, 99, 101, 105, 129, 135], and six studies with supervision [71, 114, 119, 127, 129, 144]. In general, these studies reported significant and positive effects on the employee outcomes job satisfaction (13 studies), employee retention (8 studies), and employee performance (9 studies). Two studies, however [78, 111], reported non-significant effects on employee retention, and one study reports a negative effect on job satisfaction . Only three of these financial incentive-related studies reported on organizational performance (i.e., quality of care) [86, 115, 129]. Scheduling and rostering were also frequently reported motivation-enhancing practices (n = 31, 36.5%). Scheduling and rostering were often combined with skills-enhancement interventions (18 studies) and empowerment-enhancing practices (13 studies). Of these studies, 23 reported positive effects on the employee outcomes turnover intention, job satisfaction, and/or employee performance. Positive effects on the organizational outcomes quality of care and reduced waiting time were reported by eight studies. Leadership/management support practices (n = 24, 28.2%) were researched mostly in combination with the skills-enhancing interventions training and staffing, along with the empowerment-enhancing practices team work and supervision. In general, these studies reported significant improvement and positive effects on employee outcomes (e.g., staff retention, job satisfaction and task performance), organizational (e.g., quality of care), and patient outcomes. Some studies [112, 116, 171] showed inconclusive results on the relationships with employee outcomes and patient satisfaction. Less frequently researched were bundles using motivation-enhancing practices based on recognition (n = 16, 18.8%) and staff performance appraisal (n = 12, 14.1%), which have often been combined with skills-enhancing training and empowerment-enhancing practices (e.g., task shifting, communication, team work, employee engagement). These studies reported significant improvements and positive effects on employee outcomes (e.g., performance, retention, job satisfaction and intrinsic motivation) and organizational outcomes (e.g., quality of care, reduced waiting time). Skills-enhancing HRM practices were researched in 66 studies (77.6%). These studies mostly focused on training, staffing, and mentorship. Only four studies (4.7%) researched bundles that solely contained skills-enhancing practices [89, 128, 170, 173]. Three of these studies showed significant improvements in organizational outcomes (e.g., efficacy and quality of care) [89, 128, 170] while one study reported enhanced employee performance . As a side effect, some studies mentioned that trained employees may subsequently leave for better jobs and hence increase turnover. As mentioned above, 34 studies report on bundles combining skills-enhancing practices with motivation-enhancing practices. Eight studies combined skills-enhancing practices (e.g., training, staffing) with empowerment-enhancing practices (e.g., supervision, feedback, teamwork) [68, 73, 84, 86, 133, 134, 151, 152]. They mostly reported significant positive effects on organizational outcomes (e.g., quality of care and patient safety). Among the skills-enhancing practices, training occurred most frequently (50 studies), followed by staffing and recruitment practices (23 studies). Most of these studies were associated with employee outcomes (e.g., retention, task performance, job satisfaction, and motivation), and less with organizational outcome (e.g., quality of care) (13 studies) and patient outcomes (2 studies). Only one study researched skills-enhancing training combined with motivation-enhancing practice (i.e., supplementary allowances) and showed improved employee outcomes (i.e., job satisfaction and reduced moonlighting) . Two studies showed that written job descriptions (in combination with training, staffing, and empowerment- and motivation-enhancing practices) yielded significantly positive effects on organizational outcomes (i.e., efficiency and quality of care) [133, 168]. Empowerment-enhancing practices (n = 42, 49.4%) mainly entailed teamwork, communication, and supportive supervision. Only two studies considered purely empowerment-enhancing bundles, one of which showed improvements in the patient outcome maternal mortality , and the other reported improvement in the organizational outcomes quality of care and staff shortage . Most studies (n = 30, 35.3%) that addressed empowerment-enhancing practices considered one empowerment-related practice combined with other practices. Eleven studies researched empowerment-enhancing practices (e.g., team work, supervision) combined with motivation-enhancing practices (e.g., compensation, scheduling) [70, 78, 99, 105, 110, 115, 117, 127, 136, 140, 163]. These studies mostly reported improvement on employee outcomes (e.g., satisfaction, retention, performance). Some reported improvement on organizational outcomes (e.g., quality of care, efficiency) and patient experience (i.e., satisfaction and clinical outcomes). However, one study  reported no improvement on the employee outcome turnover intention. Communication/feedback practices (16 studies), teamwork (15 studies), and supervision (14 studies) occurred most frequently in combination with skills- and motivation-enhancing practices. Most of these studies were associated with improved employee satisfaction, motivation, retention, and performance. Nine studies reported improvement on the organizational outcomes (e.g., quality of care) and to a lesser extent to patient outcome [68, 73, 84, 86, 87, 91, 129, 133, 168]. Of the empowerment-enhancing practices, employee engagement, work-life balance, job autonomy, job security, and safety were less frequently researched (six studies). Of these studies, six reported positive effects and improvement on employee outcomes (e.g., job satisfaction, motivation, retention, task performance) [72, 117, 124, 132, 140, 169]. Positive significant effects on the organizational outcome quality of care were reported once . For the first time, an overview of studies that researched the link between HRM and performance in SSA hospitals is presented. The literature shows that HRM affects four different categories of performance outcomes: (individual) employee, team, organization (as a whole), and patient outcomes. Employee outcomes and organizational outcomes are frequently researched, whereas team outcomes and patient outcomes are significantly less researched. Evidence of the effect of HRM on patient outcomes, probably mediated via HRM outcomes, for now primarily builds on studies outside the SSA and studies with low quality of evidence within the SSA setting [17, 19, 24, 39]. Given the scarcity of human resources and the disproportional high burden of disease in SSA, further research on the effect of HRM practices on patient outcomes in SSA contexts is urgently called for. As previous studies reveal that contextual characteristics impact outcomes [16, 18, 33], contextual characteristics need to be taken into account, as can be attained by adopting the Context, Intervention, Mechanism, Outcome (CIMO) logic [52, 179, 180]. This review revealed 18 types of HRM practices that were researched in relation to performance of SSA hospitals. As shown in Table 7, this number is comparable to the 26 types of HRM practices presented by Boselie et al. ; 13 HRM practices (within high-performance work practice) shown by Combs et al. ; 10 HRM practices acknowledged by Hyde et al. ; and 6 HRM practices presented by Dieleman et al. . Table 7 summarizes several reviews on HRM in different settings and shows that there is overlap in HRM practices. For example, training and education, compensation, recruitment, and team working are shown to be effective in many reviews. Although there is overlap in HRM practices researched in SSA context and the above mentions studies that researched HRM practices in a broader context (e.g., training, pay, and reward), three areas are under-explored in SSA. First, in SSA context, HRM practices related to employment are only researched in terms of staffing, rostering, and scheduling, but not in terms of selection, diversity, equal opportunity, exit management, and egalitarianism. On the other hand, employment regarding moonlighting is explored in SSA context, but rarely in overall HRM literature. Second, direct participation is studied in terms of communication, empowerment, and management, but not in terms of indirect participations through committees and councils, or in terms of socialization and social responsibility practices. Third, the professionalization of HRM function/department as a HRM practice is not researched at all in SSA context. These differences could be explained by the difficult SSA labor market that is characterized with low wages, the collectivistic and hierarchical organizational culture, and the lack of officially appointed HR functions. To present a systematic review of empirical studies investigating the relationship between HRM and performance in SSA hospitals. HRM practices in SSA are linked to all categories of performance outcomes: individual employee outcomes (task performance, job satisfaction, motivation, retention, reduction in workload and moonlighting); team outcomes, organizational performance outcomes (quality of care, patient safety, timeliness, service efficiency, staff shortage) and patient outcomes (patient experience and clinical outcomes). Bundles of practices are more likely to positively affect performance than single practices. There is insufficient evidence that a specific HRM practice is superior in increasing performance. Local and wider external contextual factors need to be taken into account when doing research in health sector. To see whether there might be commonalities and widely accepted trends in the theoretical perspectives, conceptualizations and methodologies used in the field of HRM and performance research. The relationship between (some form of) HRM intervention and (some indicator of) performance is mediated by linking mechanisms. To identify and analyze studies that investigate the relationship between at least one HPWP and organizational performance. HPWPs have a higher impact than individual practices on organizational performance (focused on operational and financial performance outcomes). HRM interventions can improve health workers’ performance. Mechanisms such as increased knowledge and skills, feeling obliged to change and health workers’ motivation caused change. Continuing education is likely to be effective in short term. Combined interventions are more likely to be effective in the long term. Thereby, context should be taken into account. The minority of included studies focused on single HRM practices. They mostly found positive effects on performance. Most included studies reported on implementation of HRM bundles, as is in line with Subramony  and Boselie et al. who claim that HRM bundles are likely to be synergistic, thus yielding stronger effects on performance than single HRM practices . In SSA, training and education are the most researched single HRM practice. Training is one of seven Pfeffer’s best practices, which is believed to lead to superior outcomes in any setting . Training is evidence to positively impact outcomes in all four performance categories. Training and educating caregivers in non-technical skills (e.g., communication, awareness, interaction) is a worldwide trend within the hospital setting and is proven to lead to higher team performance, patient safety, and organizational performance [181–183]. Task shifting/ role delegation in SSA hospitals is the second most researched single HRM practice, and mostly evidenced to relate to improved organizational and patient outcomes [95, 103, 161, 162, 164]. Task shifting is seen as one of the most important policy options to alleviate workforce shortage and skill mix imbalances in low-resource countries . The most common task shifting, which requires leadership support, takes place in HIV treatment where tasks are delegated from doctors to nurses and other non-physician clinicians [185, 186]. Most included studies researched HRM bundles that included practices from multiple HRM domains: motivation-enhancing, skills-enhancing, and empowerment-enhancing . Motivation-enhancing practices were most frequently researched within HRM bundles, followed by skills-enhancing practices and empowerment-enhancing practices. A significant amount of studies provided evidences on the link between a HRM bundle and improved performance (e.g., [16, 17, 19–21, 24]). Our findings show that an improvement in a specific outcome measure can be accomplished by different HRM practices or bundles and that similar HRM practices or bundles could enhance different outcome measures. For instance, job satisfaction could be improved through (a combination of) single HRM practices or bundles regarding training, management support, teamwork, promotion, autonomy, financial incentives, scheduling, and performance appraisal (e.g., [70, 79, 98, 109, 112, 117, 123, 127, 136]). This also holds for the outcomes; retention, motivation, and quality of care. Eight studies that examined a similar HRM bundles reported improvement in diverse outcome measures (e.g., employee performance, organizational outcome such as quality of care, efficiency, and patient satisfaction) [81, 82, 87, 91, 137, 176, 178]. Previous studies have shown the importance of an internal fit within a HRM bundle, referring to an alignment between HRM practices [24, 26, 29, 187]. Notable is that several included studies have combined teamwork with individual financial incentives such as salary (e.g., [99, 101, 105, 129, 135]). Although this combination of HRM practices is in HRM literature often labelled as “deadly”, financial incentives have shown to be effective and desirable in improvement programs in SSA [9, 34, 36, 37, 49–51]. This calls for further research. Our study included evidence on relationships between HRM practices and hospital performance in 19 SSA countries. Given the variety in results, we call for caution when generalizing the results to all SSA countries, or to health centers and clinics in SSA. Recognizing the importance of tailoring interventions to both internal and external context (also referred to as the “best fit approach” of HRM [27, 44, 45, 188]), we recommend future empirical research to report on relevant internal and external contextual factors. This will enable to build evidence on the mechanisms explaining how context and interventions together produce outcomes, as opposed to developing an evidence base for all of the different SSA contexts. Second, this review was restricted to peer-reviewed English articles and did not including books, grey literature, or any documents published in a foreign language. As a result, we may have failed to identify some evidence. Additionally, the inclusion criteria may have induced bias towards effective implementations and caused us to exclude interventions which produced little or adverse performance effects. Lastly, we note that our review produced little evidence on a direct relationship between HRM interventions and patient outcomes, or on outcomes at a team level. We recommend to conduct research in these areas, as team performance is evidenced to be particularly related to patient outcomes of hospitals [189, 190]. The authors thank Wichor Bramer, who is a Librarian at the Erasmus Medical Center, Rotterdam, The Netherlands, for his vital contributions in executing the search strategy. All data are available at request. The first author took the lead in writing the manuscript. The second and third authors revised and have co-written the manuscript. All authors assessed the eligibility of the found studies. The first author summarized the selected full-text manuscripts. World Health Organization , Global Atlas of the Health Workforce, WHO Regional Office for Africa. Atlas of African Health Statistics 2016. African Health Observatory. http://www.aho.afro.who.int. Accessed 15 July 2017. Systematic review resources: handbooks for doing systematic reviews. http://libguides.sph.uth.tmc.edu/systematic-review-guidance/SR-guides. Accessed 29 July 2016.